This blog and my Twitter are going dark for the next ten days as I fly out to Israel for a Birthright trip. If you’re not familiar with the organization or how it works, I highly recommend Kiera Feldman’s exposé in The Nation. Needless to say, I have some complicated feelings about my own decision to attend, but in the end curiosity and wanderlust got the better of me. I’ll have a lot more to say when I get back. Organized labor creates a labor cartel, restricting the supply of jobs and wages and limiting the opportunities of non-union workers. The argument against this is essentially ‘a rising tide lifts all ships’. Non-union workers, the argument goes, benefit from the competitive wages at union firms. I think this is true to some degree, but I think it’s also true that in order to create a system wherein organized labor has clout, artificial labor scarcity has to be created. To do that you have to limit the number of slots. This was traditionally done by excluding women and minorities from many jobs. In other countries it has been politically feasible to push full-employment policies. I doubt that it is either politically or culturally feasible in this country. Artificially limiting the number of slots by excluding otherwise capable candidates is one thing. Institutional racism and sexism are the most obviously horrible ways to do this, but even the less retrograde alternatives — such as imposing overly burdensome certification requirements on newcomers — are pretty unpalatable. So Erik and I agree there. On the other hand, full employment sounds pretty great. And while Erik’s probably right that there’s no politically feasible way to bring about full employment right now, that strikes me as an argument for, not against, supporting and building up organized labor. If we think full employment is a good thing, and we recognize that unions have a strong interest in encouraging the policy, why not strengthen their hand in that debate? But that’s just setting myself up for the obvious response from labor critics: If arbitrarily excluding otherwise qualified workers from the workforce — and if full employment is, at best, a distant pipe dream — then there’s no mechanism for creating the scarcity of labor that would make unions relevant. So why even bother with them? Why not just accept organized labor’s inevitable demise? Because Erik’s left out some other important ways we can create labor scarcity. Trying to boost employment through good monetary policy is one, as Matt Yglesias has repeatedly pointed out. Yesterday Peter Frase made another proposal: lower the cost of being unemployed through a better social safety net. If people are guaranteed some minimum level of income, and if they don’t have to worry about losing their health care coverage, then many of them will voluntarily opt out of the labor supply. Some might become freelancers, artisans, or small businesspeople. Others might choose to raise their kids while a spouse brings home the bacon. Either way, that’s a solution that allows non-union labor to pursue their own interests without competing against union workers for the same jobs. Granted, expanding the social safety net on the federal level sounds pretty implausible right now. But that doesn’t mean good things can’t happen on the state level — recall that Vermont just recently became the first state to institute a single-payer health care system. Recall also that in regions where unions still have some clout, they can lobby for social welfare expansion. There’s little that can be done on the federal level for now, but local strongholds of both organized labor and general social democracy could have a positive ripple effect. If you broadly favor one or the other — the social safety net or organized labor — it doesn’t make a whole lot of sense to exclude the other from your agenda. Clearly, we need to reconceptualize and refine both: that’s why I’ve used this space to push for open source unionism and address the welfare state’s “shameful revelation” problem. But institutional problems don’t negate first principle moral imperatives. Certainly not when those institutions can be reformed. I’m going to be at Netroots Nation in Minneapolis for the rest of the week. Probably no more blog posts until next Monday or Tuesday. I don’t really feel like putting up with Tumblr’s crashes anymore, so I’m taking a short hiatus from blogging and bringing the blog back to resnikoff.wordpress.com by this weekend. Those of you who follow me exclusively through Tumblr can continue to do so, since I’ll keep this blog up as a mirror site and continue to check in to interact with the people I follow and answer questions when I can. But I miss WordPress — it’s a more stable platform, the search feature works better, and I think it’s generally more conducive to what I want to be doing more of: longer, more reflective, and slightly less frequent posting. Anyway, sorry for the inconvenience. Back in a bit. It took me two weeks, but I’ve negotiated an uneasy truce between my sympathy for government transparency* and my understanding that conducting diplomacy responsibly demands some level of hypocrisy. So here goes. My sense, as I’ve written before, is that the damage this will do, both to Foggy Bottom’s efforts and their human assets, has been wildly overstated. That said, the negative consequences are real enough that I believe we can condemn Assange for behaving badly. Note that condemning his behavior and prosecuting him for it are two very different things. Modern small-R republicanism is a balancing act between contradictory forces: transparency and consent of the governed on one side, and the necessity for an civil service to manage some of the affairs of state while operating under some level of secrecy. The test for the state now is to demonstrate that this balance between secrecy and transparency works. ** This means proving that the state’s commitment to an open society is real, and that it accepts the risks of governing such a society. Among those risks: People will access and unveil information that they should not. Individuals can and will cause enormous trouble for the state, even when the state is more or less working the way it should. And sometimes defending a free homeland means doing absolutely nothing about it. If the Justice Department prosecutes Assange under the (deeply problematic) Espionage Act, then the United States government fails the test and proves that Assange was right about them. About us. So here’s what the government should do instead: Forcefully condemn Assange. (Check.) Then acknowledge that nurturing free and open public discourse in the modern era means accepting the possibility that something like this could occur. Lastly, reaffirm that free and open public discourse is worth that risk. 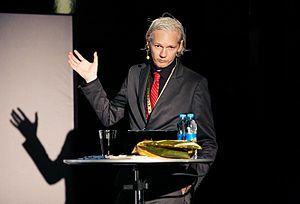 Doing that would not only prove Assange wrong, but turn a considerable headache into a victory for the American system. *Also for misfits, troublemakers, contrarians, and people with badass mountain fortresses. **Ironically, Wikileaks has already done some of the work for them. The cable dump made American diplomats look pretty good, overall. I normally don’t plug my work at Media Matters in this space, but I had a lot of fun with this one. It’s always nice when one of my geeky fixations unexpectedly overlaps with my work. Call me a cynic, but I don’t see WikiLeaks changing much — for better or worse — about the way the government both classifies information and conducts diplomacy. But until the noise subsides, it remains a fascinating curiosity. That’s why two of my favorite takes on The Great Cable Dump of 2010 haven’t been about the political fallout, but about the literary merit of the cables themselves. The two pieces, authored respectively by Reuel Marc Gerecht and Chris Beam, are at their most interesting where they diverge. Where Gerecht sees “bland and underreported,” Beam sees, “cables read like their own literary genre, with an identifiable sensibility and set of conventions.” I’d chalk that up to their differing backgrounds: Gerecht is a veteran of the CIA, while Beam, as far as I know, has never worked for the federal government in any capacity. One has spent a significant portion of his career mired in the American foreign policy apparatus, while the other comes to the cables, as most of us do, as outside observers getting a peek behind the curtain. That’s probably why I’m more sympathetic to Beam’s assessment of the cables. For Gerecht, this is nothing remotely alien about the culture of American foreign relations, so there’s nothing to report. But for the rest of us, even the mundanity of these cables (and many of them are staggeringly mundane) is news. The flashes of black humor or psychological insight are even more interesting news. Reading these documents is a little like reading the letters and diary entries of historical figures. They’re history and state given individual character and personality.